It was a great experience, and I will fill you all in very soon on the fun process! As you may know, we like to celebrate foodie holidays here on Foodie Fridays! Today is national cherry dessert day! I have to admit that I have not always been a big fan of cherries. For YEARS I could not stand anything cherry flavored. Then one day I discovered why I was not a fan of cherries. The main cherries I had been exposed to as a kid were the kind that were in the mixed fruit- Maraschino cherries. Once I realized there were more varieties, I was all over them! Give me some nice Bing cherries and I am a happy girl! I am linking up today with Annmarie from the Fit Foodie Mama and Farrah from Fairyburger for a cherry dessert themed week! This smoothie has a perfect blend of cherry and chocolate. You can not even tell it packed with some greens! Add all ingredients (minus 1/2 c cherries) to a blender. Blend well, should be thick. Add additional cherries if it needs to be thickened. Join us next week for some copy cat recipes. This entry was posted in Uncategorized on May 25, 2017 by chocolaterunnergirl. Since this week (and last) was so busy I have hardly done much cooking. But I did get a little bit of time to work up a new recipe! I am sure I am going to be munching on these all weekend too! Over the past few years I have tinkered around with adding different ingredients to change it up! One of my favorite combos adds in blueberries! They are especially good with fresh berries from the farm! One of my other fav combos I shared a few weeks ago, triple chocolate zucchini muffins. I have tinkered around with chocolate chips (of course), strawberries, nuts and dried fruit. This new experiment def adds new flavor and it is packed with nutrition! 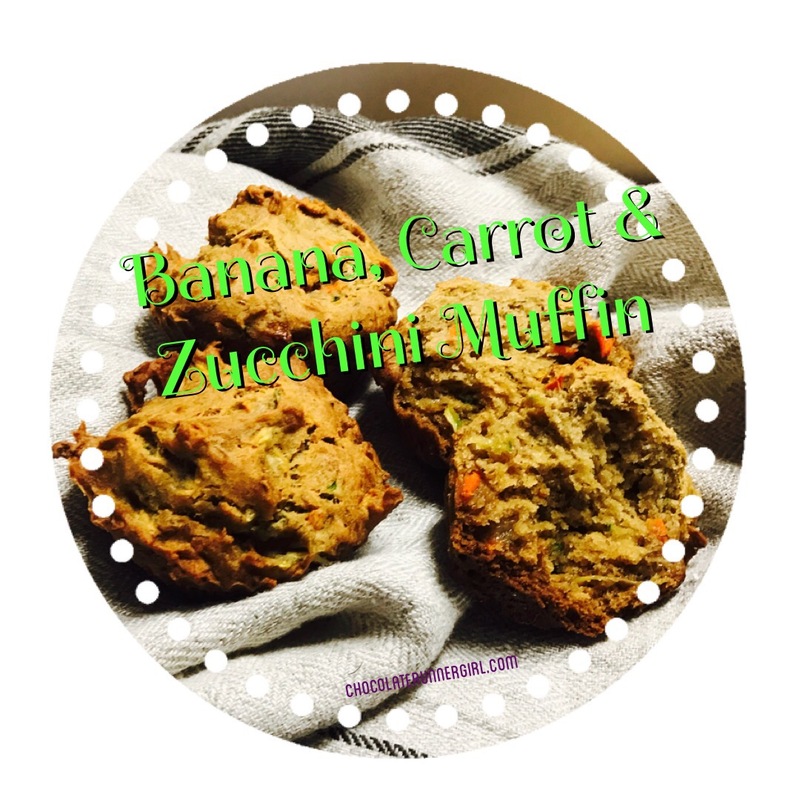 I am linking up today with Annmarie from the Fit Foodie Mama and Farrah from Fairyburger for baked goods themed week! Preheat oven to 350*. Line 2 muffin pans with silicon cups or paper wrappers. Place peeled bananas into a large mixing bowl (I used my kitchen aid, but you can also mash these by hand). Mash well. Pour in the coconut oil, mix well. Add in the coconut sugar, mix well. Add in the sprinkle of salt, baking soda, vital proteins & cinnamon, incorporate well. In a small bowl, beat together the eggs and mix in the vanilla. Add those to the banana batter, mix well. Add in the flour slowly until just incorporated. Fill the muffin cups 3/4 full. Bake for 20 min or until a toothpick comes out clean. Join us next week for some cherry recipes. This entry was posted in Uncategorized on May 18, 2017 by chocolaterunnergirl. Blueberry, banana & beet smoothie! It has been a BUSY and emotionally draining week! Each day I was away from my home for over 15 hours. Work + a few other activities have kept me on the go! May always seems to be a super busy month with the end of the school year approaching and the anticipation of summertime! One thing I have been really thankful for during this busy season is the new CSA I joined. It has eliminated some of my grocery shopping trips as well as giving me amazing produce to use when I am preparing meals! This past week I received some beautiful beets! I have always been a beet fan, even as a kid, way before they became super popular. Just the other day I was checking pinterest, and there are SO many beet recipes! Today I am linking up today with Farrah from Fairyburger and Annmarie from the Fit Foodie Mama for a seasonal finds themed week! Place beets and milk in a blender and blend well. Seriously it is so simple and tasty. So refreshing after some of my runs this week! Join us next week for some baked good recipes. This entry was posted in Uncategorized on May 12, 2017 by chocolaterunnergirl. So I have a confession for you. I have been feeling like a fraud for some time now. The name of my blog, my social media accounts and email all indicate I am a runner…and since the end of 2014, I have not really been a runner. I first took a break from running after my year of 33 races to recover and rest my hip. And then I let fear take over. I was scared I was going to hurt my hip again. Even with therapy, lots of proper recovery, strength training and other workouts (zumba, body pump, body combat, bootybarre, yoga, piyo, etc), I pretty much avoided running. I have run a handful of times since I took a break from my racing, but really not at all since we closed on our house last summer. I have some events coming up shortly and this summer that require running. So here I am, jumping back into the game. On Sunday I went for a walk/jog in the neighborhood. It was fairly warm out and I feel pretty out of running shape. Made it about 20 min of running before I about puked in my front yard (sorry neighbors). Monday I lasted a little longer. Tuesday I did a recovery walk with some friends that was lovely. Today I managed to do some sprints after Body Pump. Sprints that used to be somewhat routine (still challenging for me, but not THIS hard) made me almost puke again! I was next to a friend on the treadmill and I kept asking her to keep me accountable and to not let me stop! OMG they were HARD. I did manage to do 7 cycles of 6.0-8.0 MPH before my legs just had to stop! So I am back….slowly….in the game of running. I hope to get back my previous speed before too long, but I am going to still take it a bit easy as my hip adjust back to being a runner! Have you ever had a fear with your workouts? What helped you try again? This entry was posted in Uncategorized on May 10, 2017 by chocolaterunnergirl. Hello friends and happy Friday! What a week it has been. Many challenging things happened this week, the main one, my car needed fixed! It was making a weird noise so my loving hubs took it in for me. The mechanic was shocked my car was running! Apparently the pulley system was a complete disaster! What it is supposed to look like, vs one of the parts that was in my car! Eeek! Literally the grace of God keeping me safe while driving! Onto better things! Today is a fun day in the foodie world! I have already seen so many amazing recipes floating around from my food blogger friends! So much in fact I could be making these meals for weeks! Living in Texas the past 8+ years I have come to love me some Tex-Mex. With my food allergies it can make it more challenging to eat out (hello onions in EVERYTHING). I have come to make some awesome things over the years and I hardly even want to eat out anymore to get my fix! Since I joined a CSA a few weeks ago, I wanted to use the ingredients from my basket this week to turn into something that could fit in the Tex-Mex world. After some tweaking, I made a yummy meal. It was not super pretty, but the flavor was great! Today I am linking up today with Farrah from Fairyburger and Annmarie from the Fit Foodie Mama for Tex-Mex themed week! I pre-roasted the tomatillos and squash in the oven at 350 for about 35 min. In a blender add the tomatillos, avocado, spices to taste, and juice from 1 lime, blend well! Gently mix the squash, turkey and enough of the green sauce for your liking. Join us next week for some Seasonal find recipes. This entry was posted in Uncategorized on May 5, 2017 by chocolaterunnergirl.